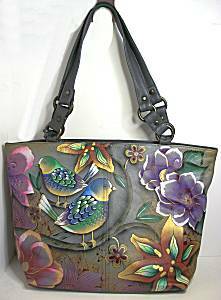 On this page we gather FLOWER PRINT handbags and accessories, jewelry with a floral theme, gathered from several of our artistically inspired designers! This classic look works especially well in spring and summer, but turn it into contemporary graphics for fall and winter to make a fresh splash! 1-3/4 inches long on sterling earwire, 3/8 inch across. Metal column is slightly curved, colored light lime with fern leaves painted in teal and brown. 1-3/4 inches long on sterling earwire, 5/8 inch across. Necktie metal shapes offer a floral of teal and turquoise on lime, smaller teal on top. 1-3/4 inches long on sterling earwire, 3/8 inch across. Metal column is slightly curved, colored silver with fern leaves painted in warm rusty red and golden brown. 1-3/8 inch pendant cast in pewter depicts apache plume flowers in relief, polished on top with blackened background. Comes on thin black cord, and poem card "Surprise me with a tiny rose, draped in a pink plume. Surprise me with a tiny rose, delicate and white. Surprise me with your simple beauty". 2-1/8 inches long on surgical earwire, 7/8 inch across. Lead-free pewter dangle is a slightly curved panel shape with brushed shiny top surface, blackened in the deep recessed pattern. Daisies and flowers work their magic in this design. Simple 7/16 inch sterling silver flower with small white seed pearl drop, is suspended from delicate 16 inch sterling chain, spring ring clasp. Snazzy canvas fabric with mocha brown background and floral print in buttercup yellow, cream, mint and coral pink. 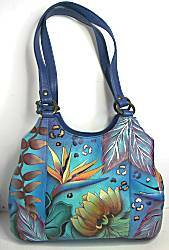 Bag is shaped to 10 x 6-1/2 x 2-1/2 inches, small open tote style. Closes with snap under flap over the top. The flap has a flower from the fabric mounted and pinked with netting peeking out from the back. Interior lined in sunny yellow with a small open pocket. The strap is wide and 22 inches long, and has a plastic tortoise linking on one side that is quite jaunty. B. Verde designs handbags and accessories in San Diego County, making her a local find for us! The "B.Jr" fabric bag shapes reflect the easy-going nature of the area, they are individually made so that no two are alike. Sturdy canvas weight fabric is a hot pink with floral design in equally bright turquoise blue, lime, orange, and cream. Measures 13 x 2-1/2 inches on shaped bottom, 8 inches tall at center and higher on the sides. Closes with snap under flap over the top. The flap is white leather with ribbon along center, then adornes with neon fuchsia disk and beads, green cord drifting downard. Interior lined in turquoise blue fabric, with the print for open patch pocket. Lime green patent leather strap. Tiny glass seed beads on wire are gathered into petals and cluster at center to form a flower-shaped pin. The wire can be bent into desirable shape, it is secured in the back to a small fabric patch. Barpin clasp is sewn onto that securely. About 1.75 inches across, the colors are pastel peach, coral red, ivory and a bit of pewter and bronze. Fair Trade product made in Nepal from Aid Through Trade. Tiny glass seed beads on wire are gathered into petals and cluster at center to form a flower-shaped pin. The wire can be bent into desirable shape, it is secured in the back to a small fabric patch. Barpin clasp is sewn onto that securely. About 1.75 inches across, the colors are shades of purple and lavender. Fair Trade product made in Nepal from Aid Through Trade. 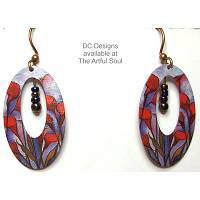 1-5/8 inches long on sterling earwire, the cutout panel depicts daffodil on long stem that is 5/16 inch wide. Colored china blue. 1-1/8 inches long including sterling earwire, 1/2 inch across. Open flower motif has bright turquoise blue color on it, tiny crystal dangling below. 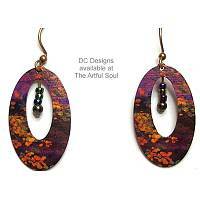 1-7/8 inches long including goldfill earwire, 1 inch across natural twig. A circle of handmade paper is colored marbled copper, the pearly ivory flower and folded green leaves also in paper that span across the opening. Tiny bead accents, all suspended by wire from the twig. Super lightweight. 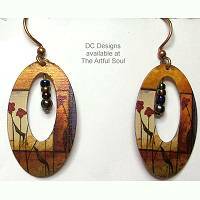 2-1/8 inches long including goldfill earwire, 1-1/8 inch across natural twig. A square frame of handmade paper is embellished across open center by swirls and flower with pair of leaves. Minty green, lilac and gold are the colors. White pearls dot the flower and leaves as well as top of twig, suspended by golden straps from twig.